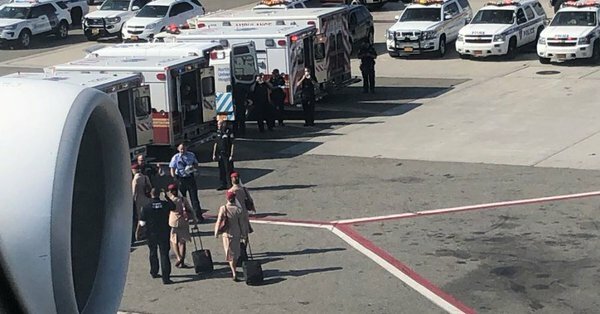 NEW YORK (FOX5NY) – Emergency personnel responded to reports of sick passengers aboard an Emirates flight arriving at JFK Airport on Wednesday morning. Hazardous materials crews were called to the scene just after 9 a.m. after the plane landed safely. The New York City mayor’s office say the plane has been quarantined. An airport source tells Fox 5 News that there was a “medical emergency” onboard the plane. Passengers were in the process of being removed from and placed onto busses. Some flight crew members were seen being loaded into ambulances on the tarmac. There were about 500 people on Flight #EK203 from Dubai. The plane had stopped in Mecca, where there’s a flu outbreak, Fox News reported.